The Rockglen and District Tourism Committee welcomes you to our totally unique tourist destination. Rockglen is about 1 1/ 2 hours south if you turn onto #2 at Moose Jaw. As you drive toward Rockglen from Assiniboia you will notice the landscape becoming more scenic and by the time you arrive in Rockglen you will have forgotten that "the prairies are supposed to be flat!" Watch for wildlife as you enter our area -- it's diverse and abundant. Look out especially for Mule Deer, Whitetail deer and Pronghorn Antelope -- they don't obey the jaywalking laws! There are many varieties of ducks, geese, hawks and owls and if you look up you may get a good look at a Golden Eagle or a Turkey vulture! A short walk into the hills in springtime will reveal a profusion of flowers. In spring you can see Crocuses, Prairie Lilies, Cactus, Phlox, Golden Rod and Evening Primrose to name only a few. Many varieties of native trees also grow naturally in our valleys, including Willows, Maples, Ash, Poplar, Chokecherry and others and, since we have vast tracts of uncultivated land, most species of native prairie grasses are still to be found. 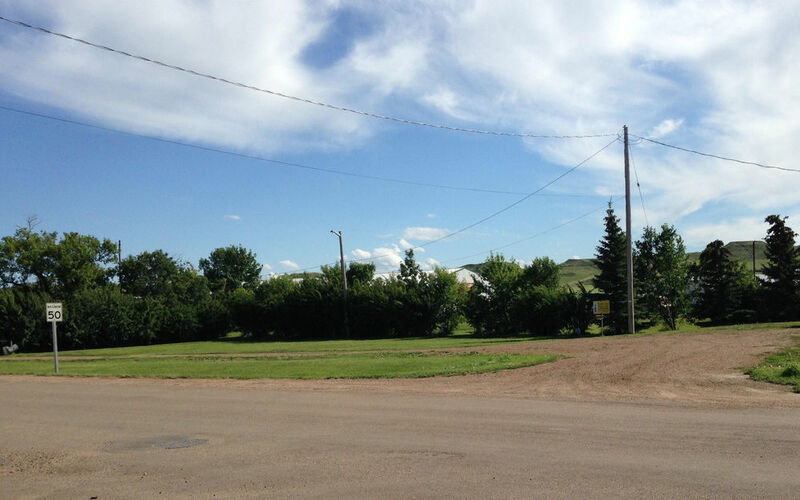 Since we are located at the junctions of #2 and #18 highways in the heart of the South Country Recreational Area, Rockglen is a natural hub from which you can explore all the tourist attractions of South Central Saskatchewan. Coronach's Outlaw Days, golf course, Mine and Thermal Generating Station, the Big Muddy Badlands, the Killdeer Badlands, Wood Mountain’s historic N.W.M.P. Post and Rodeo Ranch Museum,The St. Victor Petroglyphs and Willow Bunch’s excellent Museum and golf course are all less than a 40 minute drive. If you're coming from the U.S.A. Moose Jaw, with its Tunnels and Spa, is only 1 1/2 hours north. The Town of Rockglen Campground has 8 sites and they are located next to the Tourism Visitor Centre. must pay for a second day if they stay beyond 12/noon. Welcome to the South Country Recreation Area! Rockglen is a natural base for exploring the entire South Country Recreation Area! Park your rig at the Visitor Centre, Rockin Beach Regional Park or stay in any of our other comfortable accommodations as you explore the many attractions of South Country. As you walk through the trees, hills and valleys of the Burning Hills or Yost’s Hiking Trails take some pictures to warm your heart next winter. The Visitor Centre is a historic CPR Station and a designated Saskatchewan Heritage Site. Drop in and pick up Tourism information, have a coffee and check out the local Art and Crafts. Ask the helpful staff about local attractions such as The Effie Mattson Nature Walk. and Archeological Center. To get there; drive up Columbus Avenue to kiosk on 5th St. North which is the entrance to the Park. There, a Regional Diorama will help you visualize the massive geological forces that have formed the landscape as the last great glacier halted against the Wood Mountain Uplands. Visualize how its massive glacial meltwaters left behind the 100 metre deep valley in which you stand before carving their way southeastward through the Big Muddy Badlands toward the United States. Anyone who climbs Columbus, the hill in the Effie Mattson Nature Walk, will be rewarded with an excellent view of Rockglen and the surrounding country. Take your camera and record your achievement. The biological diversity of the plant life and archeological artifacts there are there for everyone to enjoy. Please leave them where you find them. Rockin’ Beach Regional Park - About six kilometers east of Rockglen just north of Highway #18, beside Fife Lake, is Rockin’ Beach Park. This quiet beach area has been restored for your enjoyment with ample fully serviced parking and a Reunion Centre for large group gatherings. Enjoy the various events scheduled throughout the summer or take advantage of the abundant parking, baseball fields, concession booth and playground equipment for your next family reunion or camping experience. For Birders, Fife Lake is home to the endangered Piping Plover and Northern Shrike, so you might want to walk along the shores to see if you can spot one. Unfortunately because of recent dry hot summers the lake is low we cannot recommend it for swimming, power boating or water skiing. The Wood Mountain Uplands west of Rockglen are one of only four areas in North America unaffected by the last glaciations. 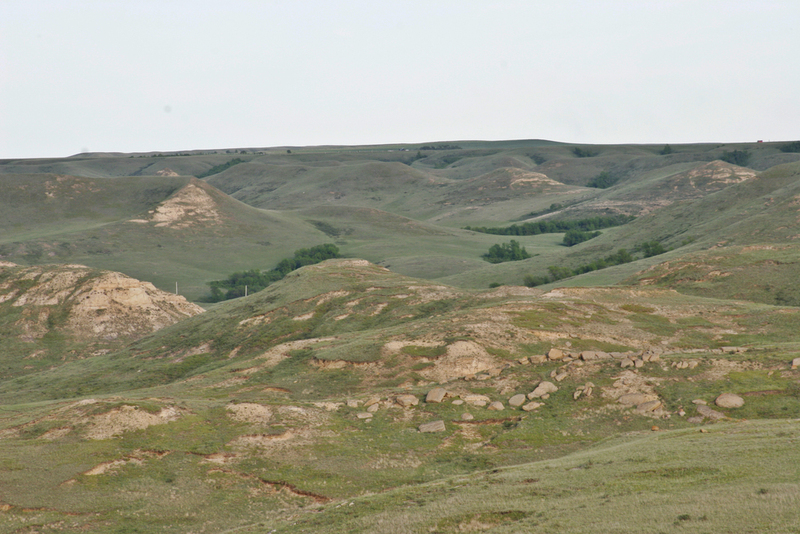 Because of this, the Killdeer Badlands of Grasslands National Park just west of Killdeer were the site of the first Duck-billed Dinosaur fossils found in Western Canada and a large Sea Turtle whose fossils can be seen in the Royal Museum in Regina. We hope to make our local archeological digs available to tourist viewing in the near future. Enjoy your stay! Park your rig and explore our many regional attractions, each within a half hour’s drive, or ask about the availability of chartered tours. Spend a day or a week - there'll still be plenty to see and do. Killdeer Badlands - Killdeer is twenty five minutes west of Rockglen on Highway #2 . There, a right turn onto Highway #18 West will take you to the east entry road to the Eastern Block of the Grasslands National Park. This National Park is a 450 square kilometer preservation area, representative of the hills, valleys and creeks of the natural Prairie Grasslands region of Canada. The authentic prairie plants and wildlife, cultural landscapes and the area’s geological sites are all protected by law. Permitted activities include hiking, primitive camping, horseback riding, birding, amateur astronomy and photography. Perfect for eco-tourism, it is an authentic reminder of what Canada’s pioneers saw as they came to settle this untamed land. history of the Wood Mountain Stampede, Canada’s oldest continuous rodeo. (Yes, it is longer running then the Calgary Stampede). While you are walking around the grounds, take in the original North West Mounted Police Post. Initially established to serve as a Customs Office and Police post, the NWMP provided protection from such bandits as Butch Cassidy and Dutch Henry. The Post later served as Headquarters for Inspector Walsh as he monitored the Sioux who came to the Wood Mountain area after the Little Big Horn Massacre. Reconstructed on the original site, using the original plans, the buildings house displays of authentic North West Mounted memorabilia. When you’re finished, round up the kids and head for Rockglen for a steak and a good night’s rest! This morning brings a whole different set of vistas. Phone Coronach and District Tours(306) 267-3312 to pre-book a tour of the Big Muddy Badlands, then head twenty-five minutes east along Highway #18 to Coronach, home of SaskPower's Poplar River Power Plant and Luscar Mines. A two hour Mine tour that starts at the Information Booth will take you through Saskatchewan’s first environmentally advanced thermal power generating station. From there you’ll be driven to view two of the largest draglines in North America at Luscar Mines. These HUGE machines are used to strip away the overburden and mine the coal that’s burned to produce steam for the generators. Big Beaver & Big Muddy Badlands - Coronach and District Tours will then take you on to Big Beaver. Take in their Museum and stop in at Aust’s General store. Be prepared to be amazed at this authentic family Department Store that takes you back to the 1940’s. Don’t Miss it! 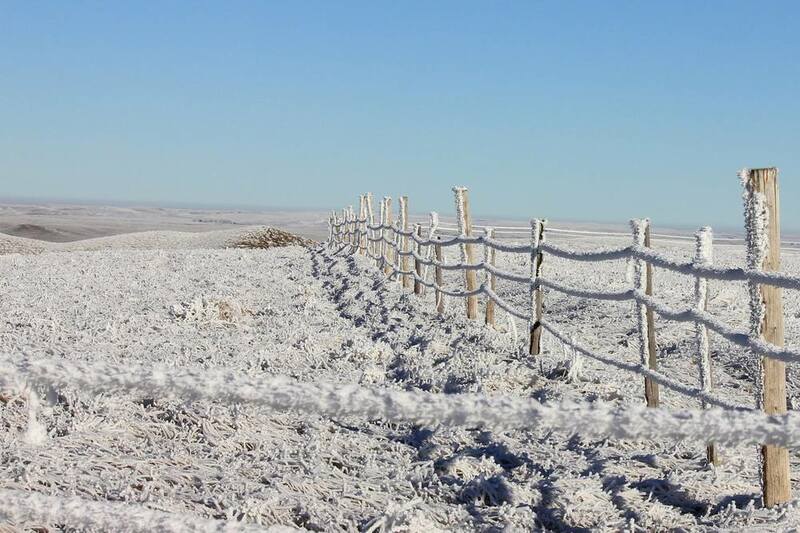 to examine the old NWMP Post and a country school, as well as a number of Indian relics. On your return, take in the Coronach Museum before you head back to Rockglen for supper and a well deserved rest. in the local ambiance. Hike up Columbus, take a short drive up the South Hill Road Hiking Trail for some memorable photographs taken from 1050 feet above the town. Bowl few frames, take a Tour out to the meteorite crater or go for a walk along Rockin’ Beach. Take it easy, after all it IS a vacation! After lunch, take Highway #18 east 15 minutes to #36, make a left and drive north another 15 minutes to Willow Bunch. This historic community lies in a beautiful valley and boasts a great golf course. The Willow Bunch Museum and Heritage Society honors it’s pioneers bilingually. The Museum is found in the Old Convent at 8-5th Street and is open year round. Here you'll learn more of the Willow Bunch Giant whose 8 foot height condemned him to both fame and notoriety. You’ll hear the history of this oldest town in the area and of Jean Legare, a key figure in opening up this part of the west. As evening approaches be sure to be in St. Victor before the sun goes down because the best time to view the Petroglyphs is when the sun is low. Located on the rim of a plateau 150 meters above the Village of St.Victor is a massive Ravenscrag sandstone that tells a mysterious tale of a people who lived here hundreds of years before recorded history. The story is told in over 300 carvings on the upper surface of the cliff and it’s a story not yet fully deciphered. Carvings of animal tracks, human faces, human footprints, human hands and a figure of a man holding or reaching out to a circle. Carvings of the Plains Grizzly Bear are most common and leave a record of this great bear’s life on the plains before the arrival of the fur traders. The total lack of carvings of horses or horse tracks attests that these carvings predated the arrival of the white man. We hope you'll enjoy spending a few days with us. Rockglen and District Tourism is a work in progress and new things are happening all the time! Make a point to come see us for a uniqe and memorable vacation! Fife Lake Rail Line Ltd.
Knoss Plumbing & Heating Ltd.